Join the 30,000+ professionals who have taken their careers to new heights by demonstrating their Hootsuite expertise to clients and employers. Take the exam to get certified today. Get your Hootsuite Platform Certification by passing a 65 question online exam testing your ability to use Hootsuite effectively. The online exam is based on Hootsuite's free online Platform Training courseware—a series of 45 video tutorials covering everything from engaging with prospects to running effective social media campaigns and contests, using Hootsuite. How is this different than Hootsuite’s Social Marketing Certification? The Social Marketing Certification demonstrates your knowledge of the core principles and strategy behind social media marketing. 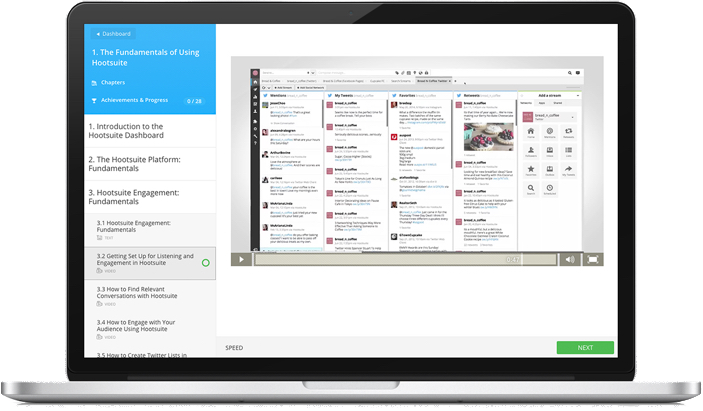 The Hootsuite Platform Certification demonstrates your knowledge of the Hootsuite dashboard. How do I prepare for the Hootsuite Platform certification exam? The comprehensive Hootsuite Platform Training uses a series of video tutorials covering essential knowledge of the Hootsuite dashboard. Topics include publishing content, engaging with followers and prospects, and running social media campaigns and contests. Yes. If you’re confident in your Hootsuite Platform skills, you can go straight to the certification exam.